Talk about Nintendo, Xbox, PlayStation and other Sega game consoles here. does anyone know which security settings in your router are compatible with wireless internet for the psp, ds lite, and the switch....all my modern stuff works fine online, but when i got the switch i remember i had to change the security setting to WEP (i think) and now the psp and the ds no longer connect online...i get a message saying they are not compatible with my wifi basically. does anyone know how to make it so everything connects? You may need to choose an older security protocol for those system to work. You could use another router and bridge them together and use it for your older security protocol systems. There may be better ways to implement it but that's just off the top of my head. I don't have a PSP, but my Switch and DS are both connected online. Switch shouldn't require anything fancy. WPA2 internet should work, or you can buy a LAN adapter and use ethernet. Most online games require a subscription. 1. Plug an older wireless router into your new router (this is what I did) and use the connection from that. Hold down the reset button on the old router to clear any previous settings/passwords, plug the port labeled "internet" on the old router onto any of the free ethernet ports on your new router, and you should be good to go. 2. Make a wireless hotspot with your phone and set the security settings to either open or WEP. This works on Android, but not Iphone since Iphone only lets you make a WPA2 hotspot. 5. Disable security settings on your router. This is probably a bad idea. WEP is not considered secure these days, so leaving your router in WEP mode isn't the best idea anyway. What did you try doing with the old router? I just bought one from a garage sale for $1 and literally all I had to do to get my DS connected to it was hold down the reset button, plug the old router into my new router, and plug in the AC adapter. well my situation is interesting . the router i use is actually an older router than the one i tried to plug into it. i have a westell 7500 router. several months ago my isp sent me an upgraded router however i could not get it to work with my dc even if i disabled firewall. so i stuck with my old westell router. the new router i tried last night i believe only has options for the newer wpa security. i guess i could go out and try to find an older router. would it be ok if i send you a pic of my router? Sure, you can send me a picture of your router. Here's the old router I'm using. I don't think it matters what router the new one is. 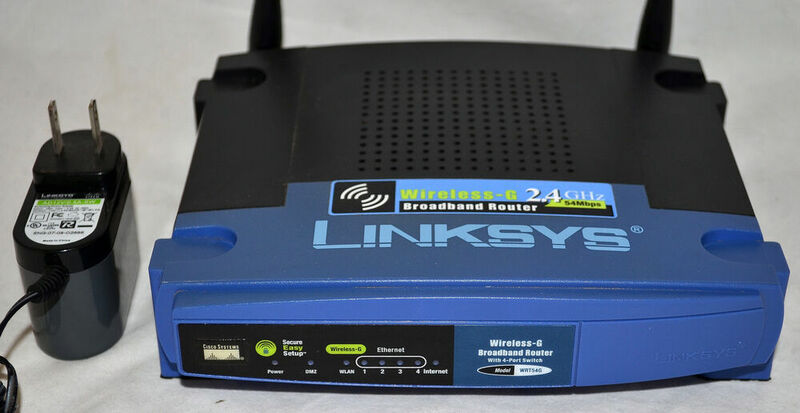 If you want it, just look up "Linksys router" on ebay and have it only show listing under $20 and you should see a bunch of them. I don't know what the exact model number is or if that matters, but it looks exactly like this. If you want one even cheaper, I'd suggest stopping at a few thrift stores or garage sales(assuming they're in season) on your way home from work or something. You can often find old routers for cheap there. I paid $1 for mine at an estate sate and had to do very little fiddling with it to get my DS connected. so did you have to go into your router settings and change the security for the linksky? NBA 2K Series Is Back Online! NFL not your thing? Fear not! Shuouma has you covered! NBA 2K1 and 2K2 are now back online!